We toured the National Weather Center building at Oklahoma University with our son Brandon before his decision to attend Oklahoma University to study Meteorology. We sat in a 360 degree tower with expansive views of the Oklahoma prairie. I asked the guide, “Is this building tornado-proof?” The answer was, “Yes, and bomb proof also…the glass is bullet-proof, structural steel frame, the exterior skin, Kevlar.” One could theoretically view an oncoming tornado from this observation tower…to gaze into the eye of destruction and stare it down. It’s not recommended. Best practice is to go to the lower floor interior gathering room. But the meteorology students cannot resist. They rush to the observation deck like moths flickering about a street lamp, unable to defy the siren call of the tempest. They are fully aware of their peculiar calling. They long for the adrenaline rush of being part of the storm, to see it, to feel it, to know it. Brandon has an incredible passion for weather, immersed in the passionate swelling tides of weather-watching by his Mom. When storms are aloft in the Oklahoma sky, his eyes twinkle like a Rockefeller Center Christmas tree. 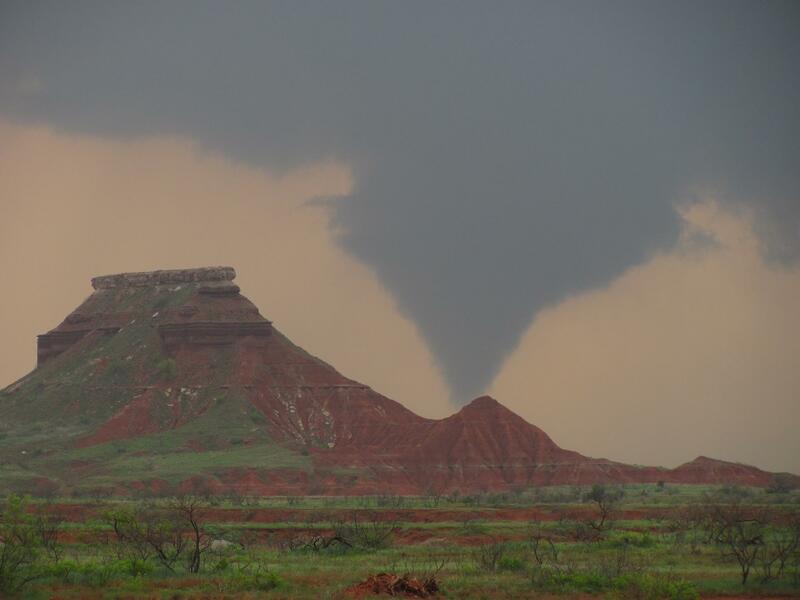 I rushed home from work one recent evening with knowledge of a tornado located about five miles southwest of our house. As I drove down our street I spotted a truck with two passengers. It was Brandon and his Mom, watching the spinning purple-black wall cloud approach. Perhaps to understand the storm-chasers addiction we can look at Job’s conclusion about wisdom: “I am unworthy—how can I reply to you? I put my hand over my mouth.” Then the LORD spoke to Job out of the storm. Perhaps storm-chasing speaks to our longing to not only understand the observable,verifiable and scientific… but also the unseen. To bring us to that holy moment of awe when we can only put our hand over our mouth in wonder. 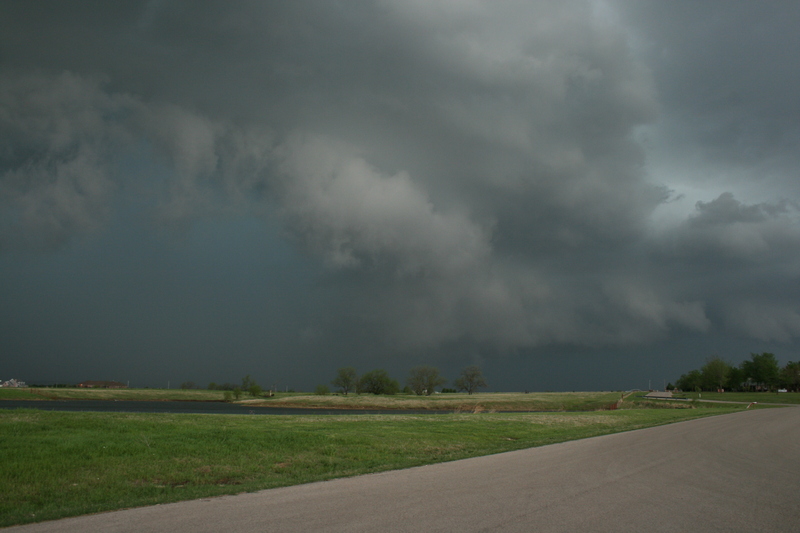 My son and a friend captured this picture on a storm-chasing trip near Waynoka, OK in the spring of 2012. He was safe on the upstream path of the twister. As a freshman Meteorology student, Brandon was thrilled to see the power and immensity of this particular tornado, as he continues his academic education in the unpredictable atmospheric conditions of Oklahoma…as well as the dimly lit mysteries viewed through a dark glass obscured by our finitude and limitations as storm-chasing humans, flittering moth-like amongst the deeper and darker mysteries not yet refined by computer code and predictive theory. Clouds build all day, hold west of the section. Plowing east he feels them piling darker, deeper. checks the hills blurring between the wheels. At the field’s end he raises the shovels, as first drops darken his shirt. He shifts into high and opens the engine for home. bounces on the road, stings his bent head and back. covers the stack with a can, and sprints for the barn. Clouds hang low and come on…a black-green curtain wide as sky. The high leaves of the cottonwoods shudder for the first time all day. Women stand on their porches and the air turns cool. and listen for the tractor whine of their husbands leaving the fields. They call the children from the barn, and turn inside to switch on the radio.